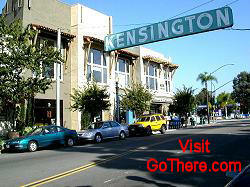 Kensington only looks small; maybe 4 or 5 blocks long, but there is much to this classy community. Slow down and smell the coffee. Sample the extraordinary cooking here. Rent a classic video to take home or buy tickets to a classic art cinema. Borrow a book and sit in a park.